? 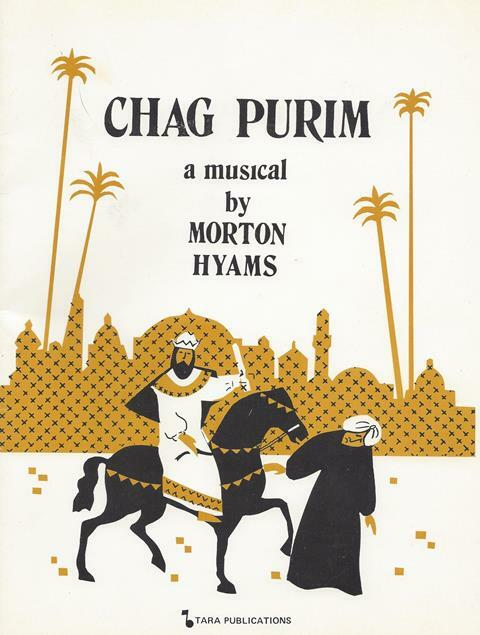 Morton Hyams >> Klezmer, Israeli, etc. 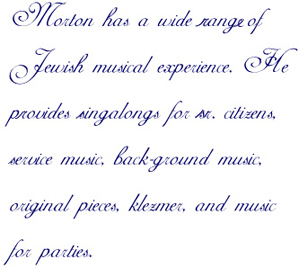 Morton has perfomed in numerous simchas in temple/synagogues in the Greater Boston area. For many years he has been a temple music director; mostly on Boston's North Shore. He has performed at Boston's Temple Israel and at menorah lighting ceremonies at the Cape Cod Mall for the Cape Cod Chabad. He composed music for an Alef Bet book published by Ktav and has played with klezmer star Frank London of the Klezmatics and Grant Smith of the NEC Conservatory Klezmer Band. requesting to sing and dance to this song! This book contains the script and lead sheets for the music. To order, please contact Morton Hyams. A Cassette recording of all the songs is also available. Please DO NOT order this book from Amazon.com. Chag Purim is lots of fun!